Many of the Freight Villages in Europe have been successfully established and positioned in the past. But how are they established within the new ranking? What can they learn from the European experience? These and many other questions focused the present study. 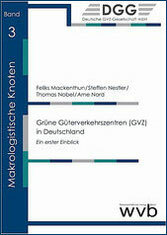 Volume 6 can be purchased here (is only avaliable in German). The study analyses the logistics facilities in more than 280 locations in the world. The book describes in details selected logistics facilities. Volume 5 can be purchased here (is only avaliable in German). The volume is a documentation of the conference “Requirements towards freight villages of the 21th century” in May 14, 2014 in Bremen (Germany). Volume 4 can be purchased here (is only avaliable in German). The study issued by Dipl.-Ing. Steffen Nestler and Dr. Thomas Nobel analyses the current development state of freight villages. In addition the challenge and new trends in sustainable green logistics as a global and important topic were shown. In this context, the solutions of problems such as climate protection in freight village were identified and transferred into a system of factors of success. The study shows that the German freight villages make a significant contribution to the development of sustainable Green Logistics, reducing CO2 emissions from transport. This effect results from modal shift in intermodal transport. Volume 3 can be purchased here (is only avaliable in German). In 2010 the freight village Bremen celebrates its 25th anniversary. It was taken as opportunity to present the successful story of development from the beginning to the present time. Volume 2 can be purchased here (is only avaliable in German). The study assesses the level of development of the European Freight Villages by a method oriented on the benchmarking approach. 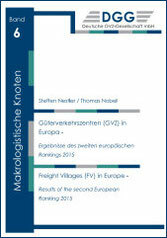 The results of this process build the first ranking of Freight Villages (FV) on European level. The study will help to provide more transparency to the market segment of international logistics centres and is oriented to give a positive impulse to the further successful European development of sustainable macrologistics concepts. Volume 1 can be purchased here (is only avaliable in German).